Enjoy 2 hours drivng from Saigon city to CaiBe' countryside. Our bike guide will tailor-make nice routes to Xeo Quyt forest. 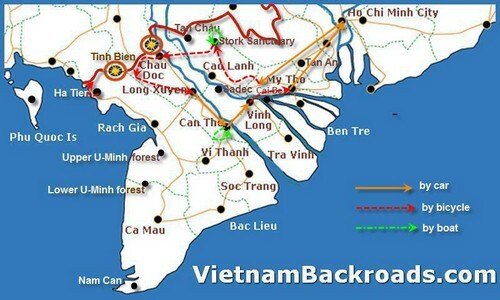 The unique routes of vietnam Backroads allows you see the back roads of Mekong Delta. You will ride on smoothly concrete paths among lush green of orchards and have some ferry crossings through a network of irrigation canals. After an hour trekking and boat rowing to explore Xeo Quyt base then your lunch will be served at local restaurant. In the afternoon, we continue cycling to Cao Lanh city. Dong Thap province has been knew as the lowest land of Mekong Delta it has flooded season in during the wet season. You will spend a morning pedaling past villages of house-on-stilts, through mango fruit gardens and race with local boats moving on rivers. After lunch, you continue to bike to Tram Chim Dist hrough a huge rice-paddis. Its depending on seasons, weather condition of time to visit, You may have a combined boat trip to discover this park and see red-headed cranes in the morning. After the boat trip to forest, we will ride to Chau Doc town via, Dong Tien, Tan Chau Dist have many ferry crossings Bassac River to Chau Doc town. We will leave Chau Doc for Can Tho today. After an hour transfer to Long Xuyen city, All will get back to the bike for rolling. You will ride through a new farming area, which was abandoned before 1975. It has only been utilized for farming since 1980. (Vung Kinh Te Moi) Finish bike ride today in urban Dist of Can Tho and have a short driving to city center.